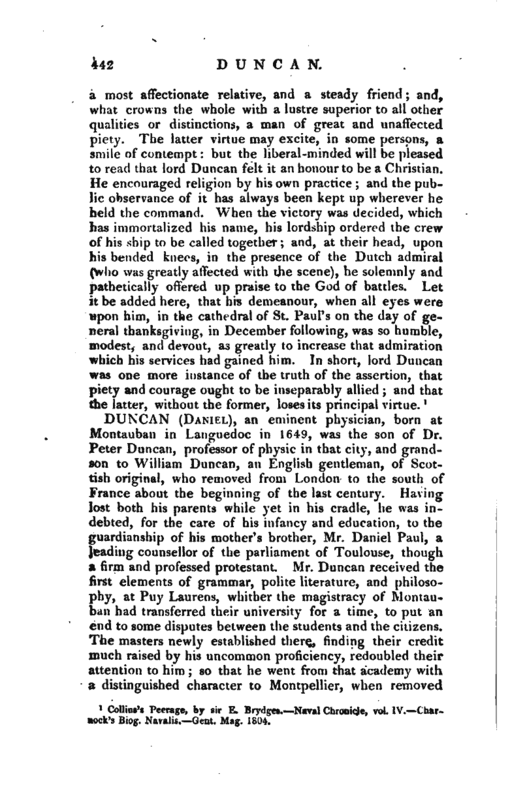 , an illustrious naval officer, the second son of Alexander Duncan, esq. of Lundie, in the county of Angus, in Scotland, by Helen Haldone, daughter of Mr. Haldone, of Gleneagles in Perthshire, was born in the month of July 1731, and received the first rudiments of education at Dundee, and, appears to have been early intended for the naval service, as his elder brother Alexander was for that of the army, of which he died lieutenant-colonel in 1771. About 1746, Adam was put under the command of capt. Robert Haldane, who was then commander of the Shoreham frigate, with whom he continued two or three years. In 174y he was entered as a midshipman on board the Centurion of 50 guns, which then bore the broad pendant of commodore Keppel, who was appointed commander in chief on the Mediterranean station, for the customary period of three years. 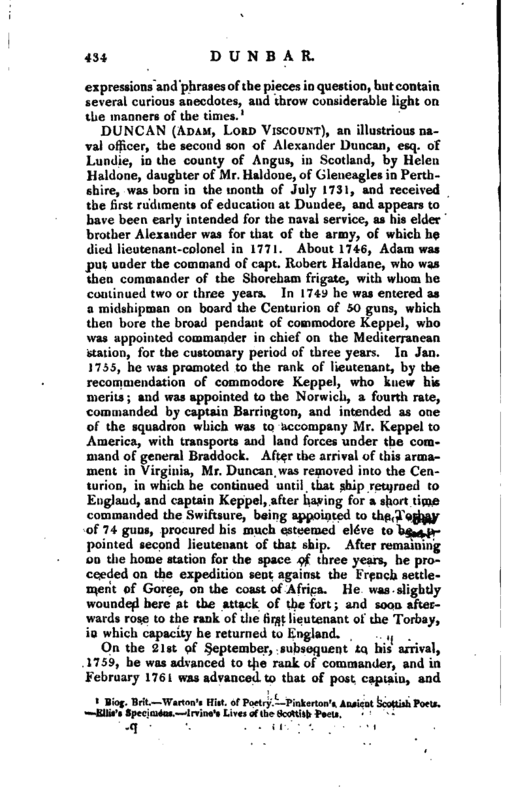 In Jan. 1755, he was promoted to the rank of lieutenant, by the recommendation of commodore Keppel, who knew his merits; and was appointed to the Norwich, a fourth rate, commanded by captain Barrington, and intended as one of the squadron which was to accompany Mr. Keppel to America, with transports and land forces under the command of general Braddock. After the arrival of this armament in Virginia, Mr. Duncan was removed into the Centurion, in which he continued until that ship returned to England, and captain Keppel, after having for a short time commanded the Swiftsure, being appointed to the Torbay of 74 guns, procured his much esteemed eleve to be appointed second lieutenant of that ship. After remaining on the home station for the space of three years, he proceeded on the expedition sent against the French settlement of Goree, on the coast of Africa. He was slightly wounded here at the attack of the fort; and soon afterwards rose to the rank of the first lieutenant of the Torbay, in which capacity he returned to England. On the 21st of September, subsequent to his arrival, 1759, he was advanced to the rank of commander, and in February 1761 was advanced to that of post captain, and | being appointed to the Valiant of 74 guns, he became again materially connected, in respect to service, with his original friend and patron Mr. Keppel, who was appointed to command the naval part of an expedition against the French island of Belleisle, and on this occasion hoisted his broad pendant on board the Valiant. Thence captain Duncan repaired with Mr. Keppel, and in the same ship, to the attack of the Havannah. 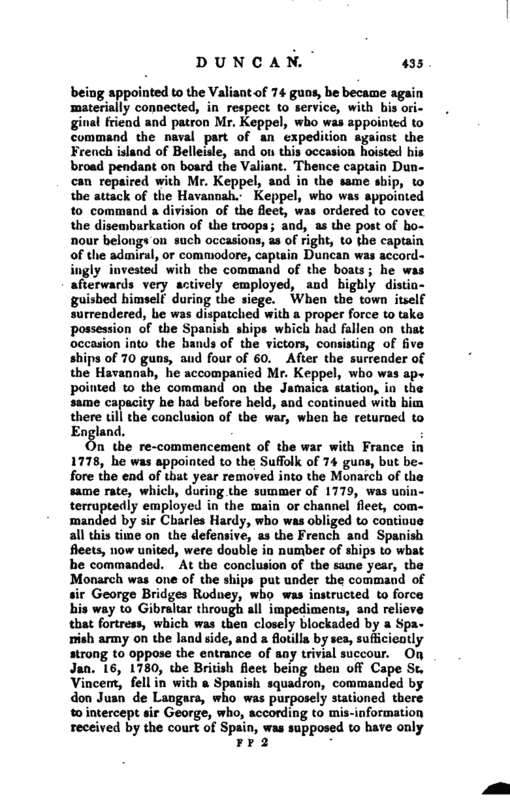 Keppel, who was appointed to command a division of the fleet, was ordered to cover the disembarkation of the troops; and, as the post of honour belongs on such occasions, as of right, to the captain of the admiral, or commodore, captain Duncan was accordingly invested with the command of the boats; he was afterwards very actively employed, and highly distinguished himself during the siege. When the town itself surrendered, he was dispatched with a proper force to take possession of the Spanish ships which had fallen on that occasion into the hands of the victors, consisting of five ships of 70 guns, and four of 60. After the surrender of the Havannah, he accompanied Mr. Keppel, who was appointed to the command on the Jamaica station, in the same capacity he had before held, and continued with him there till the conclusion of the war, when he returned to England. On the re-commencement of the war with France in 1778, he was appointed to the Suffolk of 74 guns, but before the end of that year removed into the Monarch of the same rate, which, during the summer of 1779, was uninterruptedly employed in the main or channel fleet, commanded by sir Charles Hardy, who was obliged to continue all this time on the defensive, as the French and Spanish fleets, now united, were double in number of ships to what he commanded. 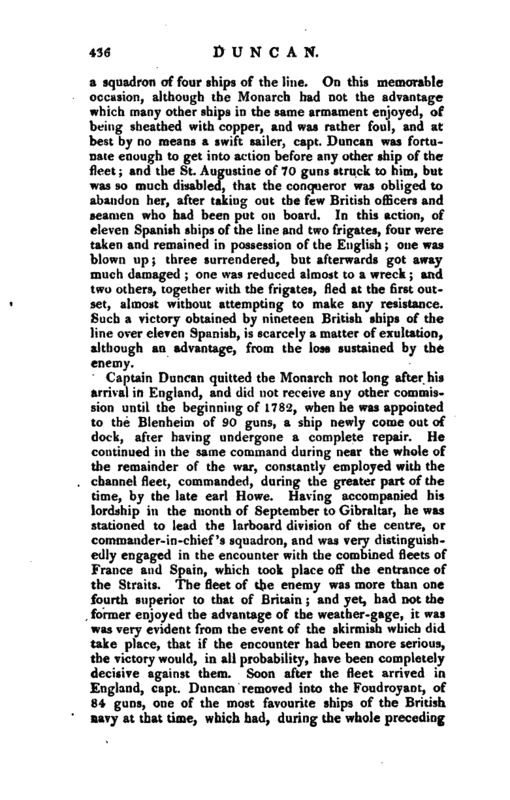 At the conclusion of the same year, the Monarch was one of the ships put under the command of sir George Bridges Rodney, who was instructed to force his way to Gibraltar through all impediments, and relieve that fortress, which was then closely blockaded by a Spanish army on the land side, and a flotilla by sea, sufficiently strong to oppose the entrance of any trivial succour. On Jan. 16, 1780, the British fleet being then off Cape St. Vincent, fell in with a Spanish squadron, commanded by don Juan de Langara, who was purposely stationed there to intercept sir George, who, according to mis-information received by the court of Spain, was supposed to have only | a squadron of four ships of the line. On this memorable occasion, although the Monarch had not the advantage which many other ships in the same armament enjoyed, of being sheathed with copper, and was rather foul, and at best by no means a swift sailer, capt. Duncan was fortunate enough to get into action before any other ship of the fleet; and the St. Augustine of 70 guns struck to him, but was so much disabled, that the conqueror was obliged to abandon her, after taking out the few British officers and seamen who had been put on board. In this action, of eleven Spanish ships of the line and two frigates, four were taken and remained in possession of the English; one was blown up; three surrendered, but afterwards got away much damaged; one was reduced almost to a wreck; and two others, together with the frigates, fled at the first outset, almost without attempting to make any resistance. Such a victory obtained by nineteen British ships of the line over eleven Spanish, is scarcely a matter of exultation, although an advantage, from the loss sustained by the enemy. Captain Duncan quitted the Monarch not long after his arrival in England, and did not receive any other commission until the beginning of 1782, when he was appointed to the Blenheim of 90 guns, a ship newly come out of dock, after having undergone a complete repair. He continued in the same command during near the whole of the remainder of the war, constantly employed with the channel fleet, commanded, during the greater part of the time, by the late earl Howe. Having accompanied his lordship in the month of September to Gibraltar, he was stationed to lead the larboard division of the centre, or commander-in-chief ‘s squadron, and was very distinguish* edly engaged in the encounter with the combined fleets of France and Spain, which took place off" the entrance of the Straits. The fleet of the enemy was more than one fourth superior to that of Britain; and yet, had not the former enjoyed the advantage of the weather-gage, it was >vas very evident from the event of the skirmish which did take place, that if the encounter had been more serious, the victory would, in all probability, have been completely decisive against them. Soon after the fleet arrived in England, capt. Duncan removed into the Foudroyant, of 84 guns, one of the most favourite ships of the British navy at that time, which had, during the whole preceding | part of the war, been commanded by sir John Jervis, now earl St. Vincent. On the peace, which took place in the ensuing spring, he removed into the Edgar of 74 guns, one of the guard-ships stationed at Portsmouth, and continued, as is customary in time of peace, in that command during the three succeeding years; and this was the last commission he ever held as a private captain. On Sept. 14, 1789, he was promoted to be rear-admiral of the blue, and to the same rank in the white squadron on Sept. 22, 1790. He was raised to be vice-admiral of the blue, Feb. 1, 1793; of the white, April 12, 1794; to be admiral of the blue, June 1, 1795; and lastly, admiral of the white, Feb. 14, 1799. During all these periods, except the two last, singular as it may appear, the high merit of admiral Duncan continued either unknown, or unregarded. Frequently did he solicit a command, and as often did his request pass uncomplied with. It has even been reported, we know not on what foundation, that this brave man had it once in contemplation to retire altogether from the service, on a very honourable civil appointment connected with the navy. At length, however, his merit burst through the cloud which had so long obscured it from public view. 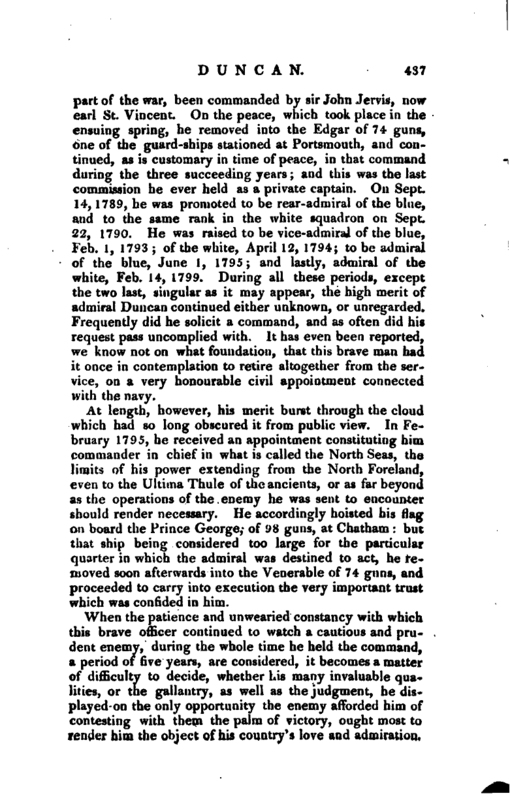 In February 1795, he received an appointment constituting him commander in chief in what is called the North Seas, the limits of his power extending from the North Foreland, even to the Ultima Thule of the ancients, or as far beyond as the operations of the enemy he was sent to encounter should render necessary. He accordingly hoisted his flag on board the Prince George, of 98 guns, at Chatham: but that ship being considered too large for the particular quarter in which the admiral was destined to act, he removed soon afterwards into the Venerable of 74 guns, and proceeded to carry into execution the very important trust which was confided in him. When the patience and unwearied constancy with which this brave officer continued to watch a cautious and prudent enemy, during the whole time he held the command, a period of five years, are considered, it becomes a matter of difficulty to decide, whether his many invaluable qualities, or the gallantry, as well as the judgment, he displayed on the only opportunity the enemy afforded him of contesting with them the palm of victory, ought most to render him the object of his country’s love and admiration. | The depth of winter, the tempestuous attacks of raging winds, the dangers ’peculiar to a station indefatigably maintained off the shoals and sands which t-nviron the coasts of the United Provinces, added to many dark and comfortless nights, all united to render the situation, even of the common seaman, peculiarly irksome: yet, in the midst of these discouraging inconveniencies, surrounded as he stood on every side by perils of the most alarming kind, he never shrunk, even for a moment, from his post, during the whole time he held this important command. There does not appear to have been a single month in which he did not show himself off the hostile coast he insulted. Nothing material took place beyond the ordinary routine of such a service for more than two years. 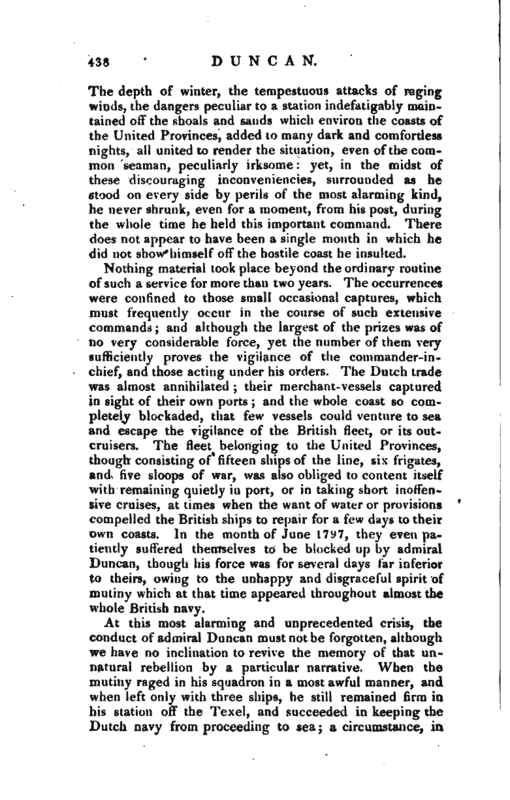 The occurrences were confined to those small occasional captures, which must frequently occur in the course of such extensive commands; and although the largest of the prizes was of no very considerable force, yet the number of them very sufficiently proves the vigilance of the commander-inchief, and those acting under his orders. The Dutch trade was almost annihilated; their merchant-vessels captured in sight of their own ports; and the whole coast so completely blockaded, that few vessels could venture to sea and escape the vigilance of the British fleet, or its outcruisers. The fleet belonging to the United Provinces, though consisting of fifteen ships of the line, six frigates, and five sloops of war, was also obliged to content itself with remaining quietly in port, or in taking short inoffensive cruises, at times when the want of water or provisions compelled the British ships to repair for a few days to their own coasts. In the month of June 1797, they even patiently suffered themselves to be blocked up by admiral Duncan, though his force was for several days far inferior to theirs, owing to the unhappy and disgraceful spirit of mutiny which at that time appeared throughout almost the whole British navy. At this most alarming and unprecedented crisis, the conduct of admiral Duncan must not be forgotten, although we have no inclination to revive the memory of that unnatural rebellion by a particular narrative. When the mutiny raged in his squadron in a most awful manner, and when left only with three ships, he still remained firm in his station off the Texel, and succeeded in keeping the Dutch navy from proceeding to sea; a circumstance, in | all probability, of as high consequence to the nation as his subsequent victory. His behaviour at the time of the mutiny will be best seen from the speech which he made to the crew of his own ship, on the 3d of June, 1797, and which, as a piece of artless and affecting oratory, cannot but be admired by the most fastidious taste. His men being assembled, the admiral thus addressed them from the quarter-deck: “My lads I once more call you together with a sorrowful heart, from what I have lately seen of the disaffection of the fleets; I call it disaffection, for the crews have no grievances. To be deserted by my fleet, in the face of an enemy, is a disgrace which I believe never before happened to a British admiral; nor could I have supposed it. My greatest comfort, under God, is, that I have been supported by the officers, seamen, and marines of this ship; for which, with a heart overflowing with gratitude, I request you to accept my sincere thanks. I flatter myself much good may result from your example, by bringing those deluded people to a sense of the duty which they owe, not only to their king and country, but to themselves. The British navy has ever been the support of that liberty which has been handed down to us by our ancestors, and which, I trust, we shall maintain to the latest posterity and that can only be done by unanimity and obedience. The ship’s company, and others who have distinguished themselves by their loyalty and good order, deserve to be, and doubtless:,v'// be, the favourites of a grateful country; they will also have, from their individual feelings, a comfort which must be lasting, and not like the fleeting and false confidence of those who have swerved from their duty. It has often been my pride with you to look into the Texel, and see a foe which dreaded coming out to meet us. My pride is now humble indeed! My feelings are not easily to be expressed! Our cup has overflowed, and made us wanton. The all-wise Providence has given us this check as a warning, and I hope we shall improve by it. On Him, then, let us trust, where our only security can be found. I find there are many good men among us; for my own part, I have had full confidence of all in this ship; and once more beg to express my approbation of your conduct. May God, who has thus so far conducted you, continue to do so! and may the British navy, the glory and support of our country, be restored to its wonted splendour, and be not only the | bulwark of Britain, but the terror of the world But this can only be effected by a strict adherence to our duty and obedience and let us pray that the Almighty God may keep us in the right way of thinking. God bless you all!” The crew of the Venerable were so affected by this impressive address, that, on retiring, there was not a dry eye among them. On the suppression of the mutiny, the admiral resumed his station with his whole fleet off the coast of Holland, either to keep the Dutch squadron in the Texel, or to attack them if they should attempt to come out. It has since been discovered, that the object of the Batavian republic, in conjunction with France, was to invade Ireland, where, doubtless, they would have been cordially welcomed by numerous bodies of the disaffected. Hence it will be seen that the object of watching and checking the motions of the Dutch admiral was of the Utmost consequence. After a long and very vigilant attention to the important trust reposed in him, the English admiral was necessitated to repair to Yarmouth Roads to refit. The Batavian commander seized this favourable interval, and proceeded to sea. 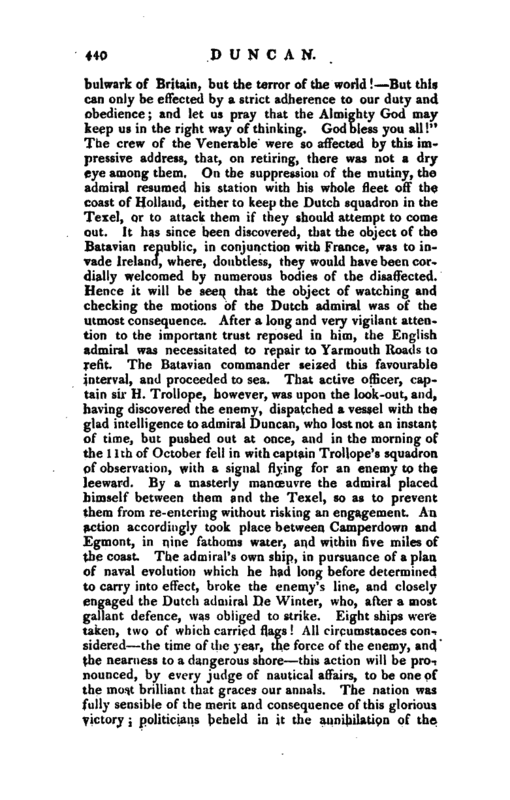 That active officer, captain sir H. Trollope, however, was upon the look-out, and, having discovered the enemy, dispatched a vessel with the glad intelligence to admiral Duncan, who lost not an instant of time, but pushed out at once, and in the morning of the 11th of October fell in with captain Trollope’s squadron of observation, with a signal flying for an enemy to the leeward. By a masterly manoeuvre the admiral placed himself between them and the Texel, so as to prevent them from re-entering without risking an engagement. An action accordingly took place between Camperdown and Egmont, in nine fathoms water, and within five miles of the coast. The admiral’s own ship, in pursuance of a plan of naval evolution which he had long before determined to carry into effect, broke the enemy’s line, and closely engaged the Dutch admiral De Winter, who, after a most gallant defence, was obliged to strike. Eight ships were taken, two of which carried flags! All circumstances considered the time of the year, the force of the enemy, and the nearness to a dangerous shore this action will be pronounced, by every judge of nautical affairs, to be one of the most brilliant that graces our annals. 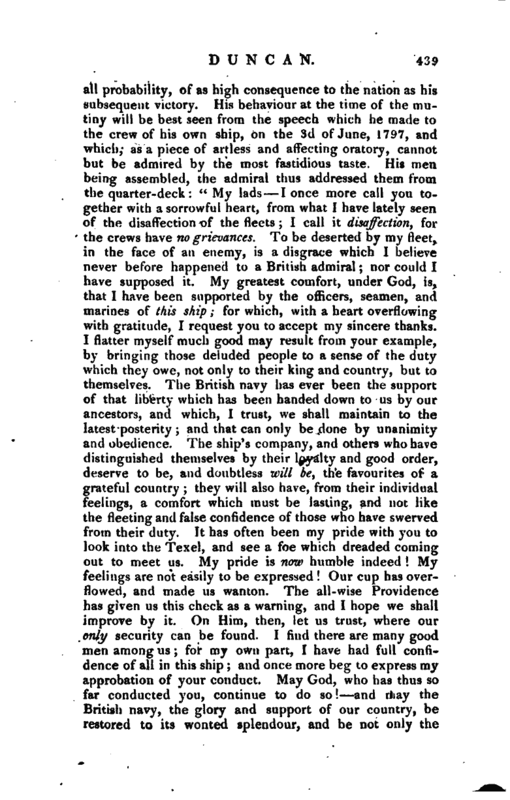 The nation was fully sensible of the merit and consequence of this glorious victory; politicians beheld in it the annihilation of the | designs of our combined enemies; naval men admired the address and skill which were displayed by the English commander in his approaches to the attack; and the people at large were transported with admiration, joy, and gratitude. The honours which were instantly conferred upon the venerable admiral received the approbation of all parties. 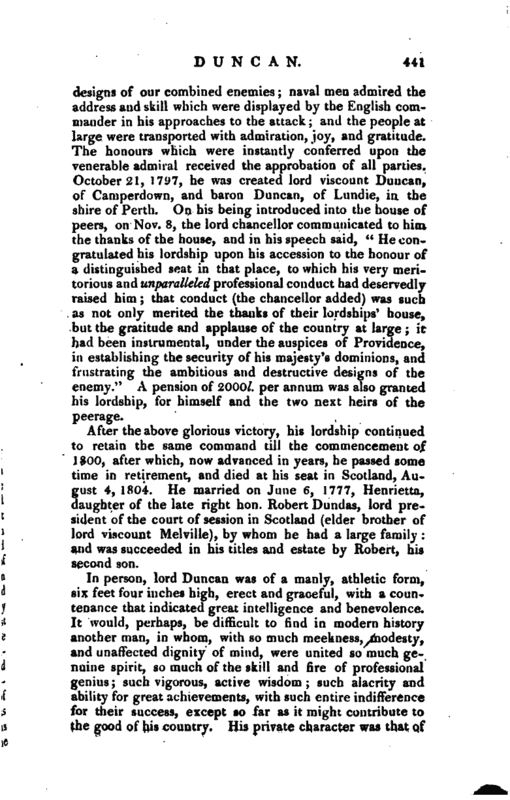 October 21, 1797, he was created lord viscount Duncan, of Camperdown, and baron Duncan, of Lnndie, in the shire of Perth. On his being introduced into the house of peers, on Nov. 8, the lord chancellor communicated to him the thanks of the house, and in his speech said, “He congratulated his lordship upon his accession to the honour of a distinguished seat in that place, to which his very meritorious and unparalleled professional conduct had deservedly raised him that conduct (the chancellor added) was such as not only merited the thanks of their lordships’ house, but the gratitude and applause of the oountry at large; it had been instrumental, under the auspices of Providence, in establishing the security of his majesty’s dominions, and frustrating the ambitious and destructive designs of the enemy.” A pension of 2000l. per annum was also granted his lordship, for himself and the two next heirs of the peerage. After the above glorious victory, his lordship continued to retain the same command till the commencement of 1800, after which, now advanced in years, he passed some time in retirement, and died at his seat -in Scotland, August 4, 1804. He married on June 6, 1777, Henrietta, daughter of the late right hon. Robert Dundas, lord president of the court of session in Scotland (elder brother of lord viscount Melville), by whom he had a large family: and was succeeded in his titles and estate by Robert, his second son. 1 Collins’s Peerage, by sir E. Brydges. Naval Chronicle, vol. IV. CharHock’s Biog. Navalis. —Gent. Mag. 1804.